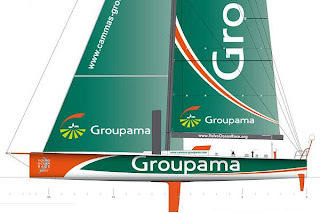 With the Jules Verne Trophy in the bag, Team Groupama is now devoting its time to preparing for the next running of the Volvo Ocean Race 2011 - 2012. Frédérique Granado, Groupama's director of external communications, together with Franck Cammas, will be presenting their new challenge on Thursday 6th May in Lorient, Brittany. Given that victories are very often shaped prior to the start, Team Groupama are actively preparing themselves for this key international event. In Lorient on 6th May, Franck Cammas and his various section managers will reveal their strategy and the measures implemented to ensure they perform at their very best during the nine stages of the Volvo Ocean Race.